Recently, Mrs. Williams’ grade 5 class at École Morden Middle School conducted interviews with several inductees living in the Morden area. We’ve uploaded transcripts of the interviews which you can read here. Morgan de Pena was inducted into the Manitoba Baseball Hall of Fame in June as a member of the Player/Builder category. Manitoba Baseball Hall of Famer Roy Seidler remembers the time Morgan de Pena showed the world his true sense of humour. In fact, Seidler remembers that de Pena was able to laugh at a time when most baseball players would probably start a fight. 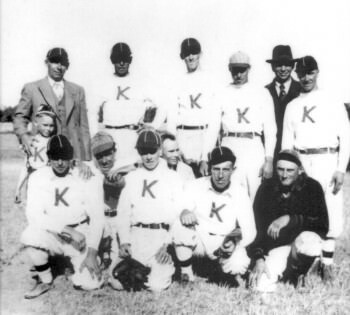 The scene is right out of a book on the history of Manitoba baseball. Roy, and his brothers Wayne and Brian, had long been the caretakers of the Manitoba Senior Baseball League’s Giroux A’s and the family had just hired a professional landscaper to come out to Giroux and refurbish the ball field. The landscaper did a beautiful job, but there was one problem. Instead of rebuilding the pitcher’s mound 60 feet, six inches from homeplate, the landscaper built it 66 feet from the dish. “So in our first game, we’re facing the Elmwood Giants in what should be a real pitchers’ duel,” Seidler said. “Brian (Roy’s late brother) was pitching for us while Morgan was going to pitch for Elmwood. “We’d all looked at the field and while a couple of us thought the look from first base to third base across the mound was kind of odd, nobody really said much. The mound was the right height, so we just let it go. “Well, we just thought it was a typical pitcher whining about a rough inning, when Morgan goes to the mound for Elmwood. He was a great pitcher. He had this big hook for a curve ball, but in this game, his curve ball was falling five feet short of the plate and bouncing up. “So we light Morgan up for a few runs in the first and he’s hot. He says to Sam, ‘This mound is too far away,’ and he proceeds to pace it off. He yells something at Sam and Sam yells back, ‘It’s the end of the first inning. We started the game under these conditions and we’ll finish it under these conditions,’ and that was that. “At the end of the game, every pitcher got ripped and it finished like 12-11 or something. We won and Elmwood wasn’t very happy. We eventually fixed the mound and thought that was the end of it. On Saturday night, June 5, Morgan de Pena and 11 other players, builders, teams and families were inducted into the Manitoba Baseball Hall of Fame in Morden. It was a celebration of what’s great about the game in our province and de Pena, now 53, enjoyed every minute of the evening. Morgan de Pena isn’t a guy who played the game, stopped and went on to something else. He’s a guy who never stopped giving back to the sport he loved more than all the others he played – and he played those others well. Perhaps one of the greatest all-around athletes every produced in Manitoba, de Pena pitched and played football for Mayville State University in Mayville, N.D. and he also played goal for the St. James Canadians of the Manitoba Junior Hockey League. While at Mayville, he also coached volleyball and women’s gymnastics – he actually became quite an accomplished gymnastics coach – and since returning to Winnipeg, a day has never gone by in which he wasn’t involved in sport in some way. Today, he’s the executive director of Baseball Manitoba and he still coaches his 14-year-old son Curtis’s baseball team and his 16-year-old daughter Melanie’s softball team. That’s commitment. Bill Chapple, Hank Lemoine, Brock McConachy and Ron Seafoot joined de Pena as players in the Hall of Fame Class of 2010. Al Kinley, Maurice Kohut and Seafoot joined de Pena as builders. The 1966-71 Brandon Cloverleafs and the 1980-85 Deloraine Royals were the two teams inducted while in the special category, both the Fortin Family from Lundar and the Kollasevich Family from Winnipeg (by way of Rapid City) were also named to the Hall. Former Goldeyes catcher Troy Fortin is now a member of the Manitoba Baseball Hall of Fame. Fortin was inducted in June along with his brother Blaine and father Roy. Photo courtesy of the Winnipeg Goldeyes. For the Fortins it was a tremendous honor. The family patriarch, Roy Fortin was a lefthanded pitcher who could hit with the best Manitoba had to offer. He also coached countless minor baseball teams and even pitched Grosse Isle into the final of the 1990 Manitoba Twilight Championship against the powerhouse Giroux A’s. Meanwhile, oldest son Troy was a great defensive catcher who could hit a ton. He represented Canada at the Friendship Games in Tyler, Texas, in 1992 where he hit .390 with 18 RBI and was named MVP. He also won the MVP award at the 1992 World Youth Tournament in Monterrey, Mexico. He was drafted by the Minnesota Twins in 1993 and played six years in the Twins minor league system before signing with the Winnipeg Goldeyes where he played three outstanding seasons. He also won a bronze medal with Team Canada in the 1999 Pan Am Games in Winnipeg. Today, Troy works for Shaw TV and last season, he was honored by the Goldeyes on Troy Fortin Night at Canwest Park. Troy’s younger brother Blaine, was also honored at the Manitoba Hall of Fame banquet on June 5. As the third and final member of the Fortin Family to be inducted, many believe Blaine could have been the best player of the trio. In 1994, he was not only named the Manitoba Player of the Year but the Baseball Canada Player of the Year. In 1995, he was drafted by the Toronto Blue Jays and played three years in their minor league system. He also represented Canada at the 1994 World Junior Championship. “Troy and Blaine were both great players, but are also very different people,” said de Pena, who not only played against Roy, but coached both boys at one point in their careers. “They were both good guys, good competitors and great athletes, but Troy was super intense, he never backed down from anything. Blaine was bigger and easier going. I’m happy to say both are still coaching and Blaine is now the president of Interlake Minor Baseball. For all of the inductees, a place in the Hall of Fame is both an honor and a credit to what they gave back to the game of baseball here in Manitoba. For a man like de Pena, who never pitched a game until he was 15 and never got any real coaching until he was 19, it was a marvelous surprise that still seems somewhat surreal. “My body says I’m 53, but in my head, I still feel I could play like I did when was 28,” de Pena said with a grin. “I started as a kid playing house league ball in River Heights. I remember I really wanted to make the Little League team. They had these awesome uniforms with embroidered cresting and everything. I really wanted to make that team and wear one of those uniforms. “Instead, I was cut and I had to play house league, where I got a black T-shirt. I never even got a hat. But I kept playing and eventually I reached a point where I made the St. Boniface Legionnaires. There, I got some real coaching from Jim Devono and Jack Scott. They were the first guys who really worked with me as a pitcher. I look back on it now and figure I was very, very lucky. Scott was formally inducted when they held their annual ceremonies on June 28, 2008, in St. Mary’s, Ontario. He is Manitoba’s first homegrown Hall of Famer. Scott, 76 years old, has contributed 60 years of his life to baseball as a player, coach, builder, and volunteer. He played on his home-based McConnell team until he was 50 years old, along with brother Glennis and father Jim. Scott coached Canada’s first national team, during the 1967 Pam Am Games. He also was involved with coaching the Red Sox senior team and several youth teams in Hamiota, Carman, Souris, Warren, Stonewall, and Carberry. Scott, a former vice-president of Baseball Canada, also was president of the Manitoba Baseball Association in 1987, where he still is chairman of the senior council. In addition, he is the founder of the Manitoba Baseball Hall of Fame and Museum. Scott has already been inducted provincially in the Manitoba Sports Hall of Fame, Manitoba Hockey Hall of Fame and the Manitoba Baseball Hall of Fame. Jimmy (Jim) Mutcheson, already an inductee of the Manitoba Baseball Hall of Fame in 1999, recently added another provincial sport induction to his long list of accomplishments on April 26th, 2008. James Adrian Mutcheson was born in Portage la Prairie, a natural athlete, particularly in both Baseball and Hockey. He won three SEMHL championships with the Miami Rockets in 1942–1962 along with Provincial A & B titles in 1962 all as a goaltender. He was also named top goalie in the South East Manitoba Hockey League three times. The sport most often linked to Jim’s name is baseball—although hockey was still a great love. He coached minor hockey from 1950–85 and was of great assistance with the building of outdoor rinks for the ‘youngsters’. 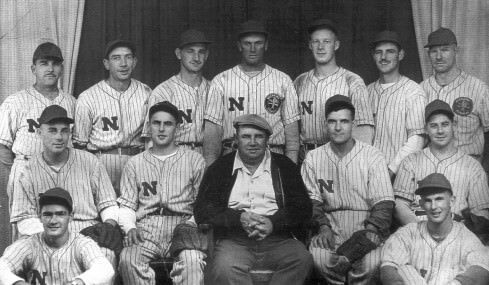 He also coached minor baseball from 1950–78 in Morden and Steinbach (helping to build Minor Ball Parks at both locations), his teams winning regionals throughout the years. In 1966, he coached Man-Dak to silver medals at the Western Canadians. Jim also served as Chairman of Little Canadian Baseball from 1974–82 and was honoured with both a 60th-anniversary medal and the Meritorious Service Medal. Jim is a man known for his continuous passion to assist teams and build parks and rinks for the ‘youngsters’, so this induction is very well-deserved.